Good morning. I’m at a workshop today. Email me if you have any questions. You should work on finishing up any details for your Informative Speech. We begin speeches tomorrow in the Ted Sorensen Theatre. Remember to go straight to the theatre tomorrow. We need to get started quickly to get through speeches. You should also be PRACTICING your speech for time to make sure it’s long enough. Be sure to get your Visual/Slide Shows finished as well and make sure it’s in the Google Classroom folder. I have put the order of speakers below. on the blog page. Check it to see when you present. Please be sure you have the draft placed and saved using the template for it in Google Classroom. You should also upload it to Turnitin.com – under the Informative First Draft assignment. See the previous post about how to submit your draft. Today I’d like you to upload your Outline to Turnitin.com (instructions below). Here is a step by step slide show with instructions. Click Create Account in the upper right corner of the screen. 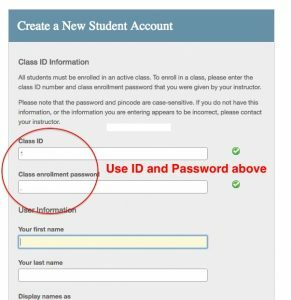 Next, click Student under Create New Account. Continue adding your personal information. Click I Agree — Create Profile at the bottom of the page. Today I’d like you to read this chapter from the textbook on Organizing Your Speech. This will help you put together your Informative Speech. Please take notes. There is a document in Google Classroom for this. Tomorrow we will cover the specifics of the Outline. Also, be sure you have told me your topic. You should work on practicing and putting finishing touches on your Demonstration Speeches today. We will begin presentations TOMORROW. The speaking order is below. Make sure your Visuals are in the folder in Google Classroom. Remember to PRINT OUT YOUR SPEECHES BEFORE COMING TO CLASS. You will NOT be able to print anything tomorrow during class. If you need to print before class, you will need to use the Media Center and have the printed copy of the speech (or note cards) with you when you come to class. Use class time today to make any changes or additions, and PRACTICE for time today. Speeches need to be 4-5 minutes long. You can go out into the hall to practice with a partner as long as you stay on task and do it quietly. We need to get started right away tomorrow, so you should come ready to speak and listen. We will begin immediately after the bell rings. Email me if you have any questions about your speeches. Final Drafts are Due Today! IF YOUR FINAL DRAFT IS NOT TURNED IN TODAY, YOU WILL BE ASSIGNED TO ARC TODAY AFTER SCHOOL. Please be sure to Color Code Each Part of your Final Draft using the following colors: This will help you make sure you have all of the parts you need. ALSO BE SURE TO SEPARATE EACH ONE OF THESE WITH PARAGRAPH INDENTS! Tomorrow (Tuesday) you will have time to make any last-minute changes and to PRACTICE!! Today we’ll be beginning to work on the Demonstration Speech. You should have a topic chosen for today. We will begin working on the Outline today. Outlines are Due Tomorrow at the end of the period. Final Drafts are due today. Be sure to check your Google Classroom folder to find the Slide Presentation titled, “Tribute Visual.” Use this to place a photo of the person you are paying tribute to. Include their name below the photo. You can have more than one photo, but you need at least one for your presentation. Below is the order of presentations. We will begin speeches on Monday. Outlines are Due Today at the end of the period. You have the whole time to work. Let me know if you have questions or need help. You don’t need to click the Turn In button in Classroom. If you are finished with the outline, start drafting. Use the same document, but put the draft above the outline on the page. Today we’re going to look at the requirements for the next speech: The Tribute. Here is a link to the assignment description. Today, we’ll begin working on the Outline. The document is in Google Classroom. You’ll use this for your outline and your draft.